The advent of electronic banking has made companies acutely aware of the critical importance of sound cash management for improving earnings performance. The name of the cash management game is to free up funds so that they either can be invested to earn interest or used to reduce debt, thus saving interest charges. Of course, before cash can be invested or used for debt reduction by the treasurer, it first must be received and deposited. The overall management objective, therefore, is to shorten as much as possible the time from the beginning of the selling process to the ultimate collection of funds. At Macquarie Bank, copies of all customer documentation including billing statements, customer-generated correspondence, and computer summary data are scanned and sorted by computer. With the document management system, service representatives can recall on-screen copies of documents while speaking with the customer, and can print a copy with the touch of a button for mailing or faxing to the customer. Additionally, documents are much easier to find, as they can be cross-indexed by customer account, invoice number, date of occurrence, customer name, or other ways. Another approach to digital image processing is to render the source form of a bill as a digital image and to transmit that image to the customer. The utilities industry is one of many industries attempting to make billing processes all digital. Killen & Associates, Inc., estimates that utility companies would save $1.2 billion annually by going to electronic billing and requiring electronic payment. However, Southern California Edison, the first utility company experimenting with electronic billing, has not seen any such savings to date during its pilot implementation. Electronic payment has not been mandatory for customers, and the savings will not come until consumer interest in electronic billing and payment rises. Still, Southern California Edison continues to support the project with the belief that savings will come in the future. Sources: “Bank Optimizes Customer Service with Document Management,” Computerworld (September 26, 1997): 56; Lauren Gibbons Paul, “E-billing: The Check Is in the Ether,” Datamation(April 1999): http://www.datamation.com/e-comm/04bill1.html. In the billing function, the goal is to get invoices to customers as quickly as possible, with the hope of reducing the time it takes to obtain payments. Having the RC process produce invoices automatically helps ensure that invoices are sent to customers shortly after the goods have been shipped. At the other end of the process, the treasurer is concerned with potential delays in collecting/depositing customer cash receipts and having those receipts clear the banking system. The term float, when applied to cash receipts, is the time between the customer’s making payment and the availability of the funds for company use. Float is a real cost to a firm. Enhanced processing of checks, charge cards, and debit cards can reduce or eliminate float associated with cash receipts. Technology Insight 11.2 discusses four other Internet-enabled mechanisms that organizations have used to shorten the float, improve e-business practices, or achieve other economies. As e-business opportunities increase, these e-payment mechanisms will become the norm in the cash receipts process. What is a lockbox? Why is a lockbox used? One of the earliest initiatives in the realm of electronic funds transfer (EFT) is the automated clearing house (ACH). If you have ever had your paycheck deposited directly to your checking account, you have been a party to an ACH transaction. Over 40,000 companies use ACH, most of them for direct deposit. In addition, the government is a big user of ACH. For instance, each month millions of senior citizens have social security checks deposited electronically through the ACH banking network. The idea of the ACH system is similar to that of a debit card. Through a prearranged agreement between trading parties, the collector’s bank account is credited and the payer’s account is debited for the amount of a payment. This transaction might happen at specified recurring intervals as in the case of direct deposit, or it might be initiated by the payer—a so-called customer-initiated payment (CIP)—via a touch-tone or operator-assisted phone call or through a personal computer. Another solution is the use of a lockbox for processing customer payments. A lockbox is a postal address, maintained by the firm’s bank, which is used solely for the purpose of collecting checks. A firm selects a variety of banks with lockboxes across the country so that customer mail arrives quickly at the lockbox. The bank constantly processes the lockbox receipts, providing a quick update to the firm’s bank balance. To provide the collecting company with the information to update customer accounts, the lockbox bank traditionally sends the company the remittance advices (RAs), photocopies of the checks, and a listing of the remittances, prepared by scanning the RAs. Many banks now offer an electronic lockbox service, by which the lockbox bank scans the payer’s remittance advice details into its computer system and then transfers the remittance advice data electronically to the collector’s accounts receivable computer system. Obviously, the electronic lockbox allows the company to post cash receipts more rapidly, at reduced cost, and with more accuracy. Two other technologies of interest relate to emerging payment methods for e-business. 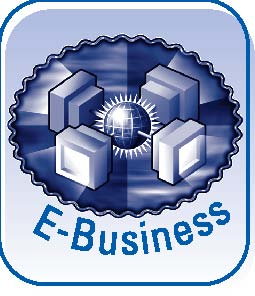 A major problem for e-business concerns payment by individual customers. Many people are hesitant to transmit personal credit card information across the Web, and others do not have sufficient credit card funds available to use. An alternative is to use either an electronic check or electronic cash. An electronic check closely resembles a paper check with the inclusion of the customer’s name, the seller’s name, the customer’s financial institution, the check amount, and a digital signature.Public key cryptography is used to protect the customer’s account. With electronic cash, a financial institution issues cash that is placed into an electronic wallet. The cash is issued in an electronic form much the way it would be in paper form. Cash is loaded onto the wallet and spent in a manner similar to a phone card. The wallet may be a card or it may be data stored on a server or the individual’s computer. However, unlike using a check, the individual making the cash transfer is generally not traceable. Electronic cash has been a little slower to catch on, as banks are only beginning to support the cash form, and accessibility to customers for use is still limited. Describe several ways that companies have used IT to reduce the float connected with cash receipts.